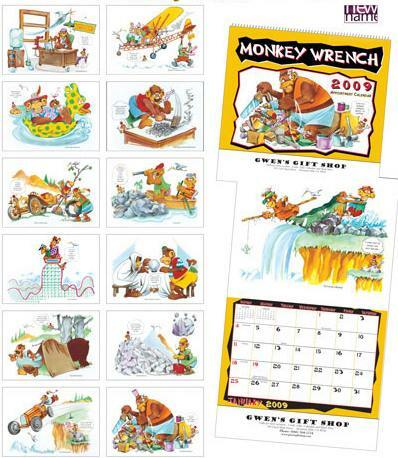 Bulk Monkey Humor calendars, custom imprinted with your text or logo. Lowest prices in USA and Canada for wholesale personalized Monkey Humor calendars. Free artwork design. We will send you a proof for your approval before going into production. Unit prices below include your 1 color custom imprint. Production Time: 7 days afterart approval. -13 high resolution glossy pictures (13 months). - Size: 10.5" x 18 1/4" (open); 10 1/4" x 10" closed. - Paper stock: 60# Gloss; UV coated covers. - Fast production: 7 days after art approval. Please check many other types of wholesale custom imprinted calendars at the same clear-out prices. You may combine different types to get the lower, higher quantity pricing. Minimum quantity per type: 150.